Hajj pilgrims at the Great Mosque in Makkah. The Center for Islamic Pluralism extends sincere greetings to hajj pilgrims and to other Muslims around the world on the festival of Kurban Bajram/Eid Al-Adha/Eid Ghorban, which, according to moon sightings, falls on the 12th of September 2016 by the Western calendar. 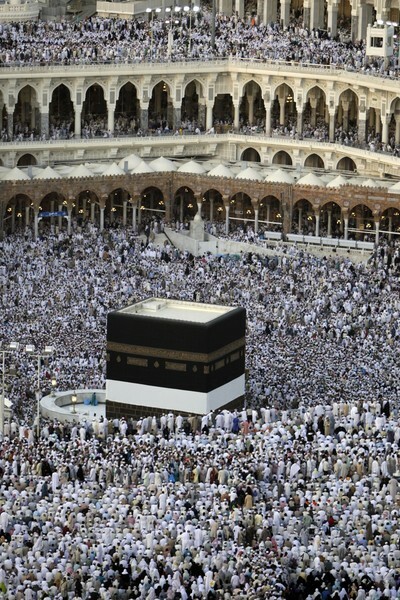 Kurban Bajram, the feast of sacrifice that concludes the hajj pilgrimage to Makkah, lasts for four days. The entire period of hajj is a time for reflection among Muslims, and this year, in particular, penitence for the atrocities committed by adherents to radical Islam. The significance of Kurban Bajram is especially poignant this year because of its proximity to the 15th anniversary of the Al-Qaida attacks on the United States, on September 11, 2001. The feast of sacrifice originates in the willingness of Ibrahim, the progenitor of monotheism, to obey God's command to kill Ibrahim's own son. God withdrew the command, showing mercy to Ibrahim and his offspring. We pray that all Muslims will celebrate the mercy and compassion of the creator at this time and through the year, every year.